Alas, no Vespas. Just Lammies. They’re $2.99 a piece from “Farm Fresh Knobs and Pulls.” I think these would look great in a little boy’s room or a big boy’s garage. 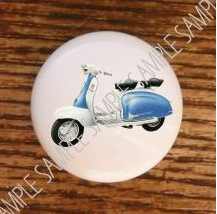 This entry was posted in Crafts, Decor and tagged drawer, knob, lambretta, pull, scooter by Tracy. Bookmark the permalink.